The two finalists for the National Lacrosse League championship in 1999 were Toronto and Rochester. The Rock, coached by Les Bartley and led in part by Jim Veltman -- two familiar names in Buffalo, won the title by a 13-10 count, finishing with seven straight wins. Both teams were less than two hours away by car from Buffalo, adding to the pressure on the Bandits to improve, and soon. With reports circulating that the Bandits were not exactly leading the league in chemistry by the end of the season, the team's management pushed coach Les Wakeling out the door. He finished with a career 10-14 record. "For some reason, the guys just didn't perform for Les," general manager Kurt Silcott said. "It was a very rough decision for me personally. Les is a good person, a good friend, a good coach. But it was a business decision for the good of the team." "It bothers me because I failed and I have an ego just like everyone else," Wakeling said. "I was very close to a lot of the guys and I've coached them for a lot of years. I feel bad for them and I'm sure they feel bad for me." Replacing Wakeling was Ted Sawicki, who had been an assistant under Wakeling for the previous two years. 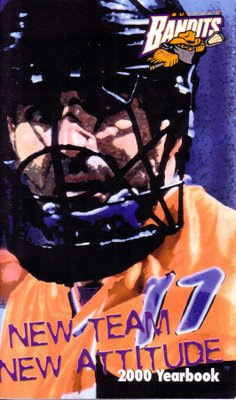 Sawicki had been a top-flight player in the days of the Major Indoor Lacrosse League, earning a championship as the goalie for the 1991 Detroit Turbos. "I've been a head coach for a club field lacrosse team in Hamilton and at the high school level as well, but no, this will be my first real venture into being a head coach," said Sawicki, who reportedly was selected ahead of finalists Terry Sanderson and Barry Powless. "I'm nervous about it but I'm also very eager." The Bandits revamped their lineup for the 2000 season. At the draft, Buffalo made a series of moves. The team had the sixth overall pick entering the draft. First, the Bandits moved up to No. 2 when they sent their pick, along with forwards Steve Fannell and John Rosa, to the expansion Albany Attack. Buffalo then sent the No. 2 pick to the New York Saints for third-year forward Chris Prat and the Saints' first pick, No. 4 overall. Next, the Bandits sent the No. 4 overall pick to the defending champion Toronto Rock for third-year forward Shawn Williams and Toronto's second-round pick. Got all that? Remember Mike Accursi, who essentially called Buffalo a bunch of old men in 1999? He'd try to speed up the tempo as a Bandit. Another important new face was Derek Malawsky, who had taken a year off after playing for Ontario in 19998. Second-round draft choice Pat Maddalena also was around. In all, nine rookies would see action for Buffalo. The goaltenders, Matt Disher and Marty O'Neill, were back. "Obviously, last year we stuck with some guys too long," said ninth-year forward Rich Kilgour. "Change is going to happen. It happens in every sport." Around the league, Albany became the latest expansion team and was named the Attack to fill out an eight-team league. Troy Cordingly was lost by the Bandits to the Attack in the expansion draft. The Baltimore franchise moved to Pittsburgh and picked CrosseFire as a name. The schedule-maker didn't do the Bandits any favors at the start of the season, putting them up against the defending champions. The Rock won that game, 17-14. "I thought Toronto took advantage of their opportunities better than we did and that was the slim advantage they enjoyed," Sawicki said. "But I can't see us going anywhere but up. It's a rebuilding year for us here and I hope the fans are patient with us. We've got great talent, we're going places." Buffalo rebounded nicely with a wild 22-21 win over Syracuse for its first home win in exactly a year. Buffalo was down five goals early in the fourth quarter, but won on Accursi's goal with 24.7 seconds left. "John [Tavares] took the shot, the rebound came from behind the net and I came off the boards," said Accursi, who finished with two goals and five points. "I fought hard out in front to get position, I got the ball and just threw it at the net. It was all like in slow motion as it was going in. Once it went in, it was such an unbelievable adrenaline rush." After a win over Albany, the Bandits dropped their first road game of the season, 17-14 on "Guaranteed Win Night" in Pittsburgh. They then back to beat Rochester, Toronto and New York to move to 5-2 on the season. This, clearly, was more Bandit-like. It also was good for first place in the standings. "Despite our fundamental bumbling and ineptness we came through and still won," Sawicki said about the New York game. "That shows a lot of character so I have to look at it in a positive way. We threw the ball away too much, we got beat to loose balls. We were poor offensively and defensively. But the ultimate goal is to get two points, so mission accomplished." Buffalo lost in Rochester, but won three of its next four games. The team closed out the season with an 8-4 record. That was good for second place, tied with Rochester and a game behind Toronto. The Bandits' offense was a big factor in their rise. They led the league in goals with 202, even if they did allow 194. Old faithful John Tavares had 34 goals and 83 points to lead the team. He was first-team all-league again, and had the added distinction of being selected as the league's Most Valuable Player. It was the first time since 1994 that Paul Gait hadn't won the league MVP. "There's no one more deserving for the MVP award than John Tavares," said Buffalo teammate Kilgour. "I know J.T. doesn't play this game for individual awards but it's great to see him get this kind of recognition. I personally think he should have won it more than twice during his career." Malawsky had 28 goals, Accursi had 30, Williams added 21 and Prat contributed 20. In goal, Disher saw most of the work. He went 6-3 in 11 games while O'Neill was 2-1 in five games. The Bandits had qualified for the postseason, and were even at home for the semifinals on April 21. However, Rochester spoiled the party with a 15-11 victory. John Grant, the first overall draft choice the previous fall and the league's rookie of the year, was named the game MVP. "John's kind of a combination of J.T. [Buffalo's Tavares] and [Pittsburgh's] Gary Gait," said Pat O'Toole, the former Buffalo goalie who got his revenge on the Bandits by leading Rochester to the championship game. "You can't believe some of the goals John scores. You're not supposed to be taking some of those shots and he's burying them." The game was witnessed by 7,873. That was virtually the same as what the team had averaged for the entire season. There was only one crowd above 10,000 at home, which is quite a change for a team that once sold out 10 straight games. In other words, Bandits' fans may have been quietly encouraged by the progress on the field, but they weren't quite ready to fall in love again.